Implement #85: Enable infinite loop for download by tags. Fix Issue #79: Don’t save if the download is not complete. Add option to dump tags search page. Fix Issue #87: Update login logic, now always use https. Download link for pixiv downloader 20150715, source code in GitHub. Hello! Im sorry for bothering, but i cant get it to work, keep getting errors: ‘Error medium page for image’. Is there something wrong? Sorry for bad english. Can you give me the image id and upload the log file to pastebin? Ensure the language in the pixiv website setting is set to either english or japanese. I changed ‘%Y-%m-%d %H:%M’ on ‘%m-%d-%Y %H:%M’ in PixivModel.py, its working now, can i fix this in binary? Pixiv language is english. Thank you for reply. checked the image, the format shows 10/19/2013 02:09. Mine is also set to english. Not sure if this is a unique issue but I’m getting this while trying to login. Thanks and sorry for the spam! Can you open https://www.secure.pixiv.net/login.php in chrome/internet explorer and see if there is any certificate error? It should show like this: http://i.imgur.com/8Z4srsI.png. 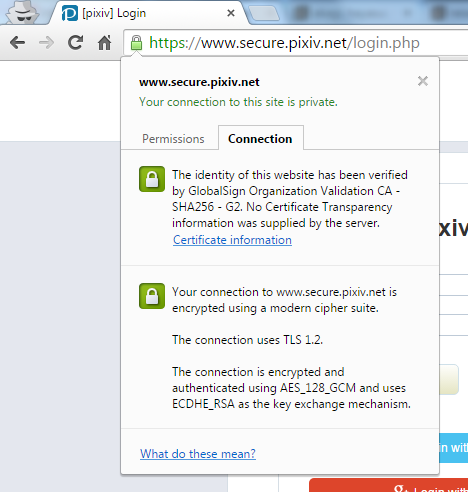 Most likely something is intercepting the ssl access to pixiv (e.g. firewall) or the browser certificate is not updated. I checked the certificates and they are like you show in the image, and since I’m using the downloader for a very long time, Firewall shouldn’t be an issue. IFor no apparent reason, the downloader now works fine. Maybe it was a random problem of my very old pc. Tnaks again for the support. The readme.txt says that it should download the medium sized version instead, but it doesn’t. Is there something I can do to fix this? Do I have to wait for Pixiv to fix these broken images, then re-download them? ah, I haven’t update the readme. Last time it will try to download the big image, then the medium one due to the filename can be inferred based on image id + _big +_p#number#. Since they changed the naming, it will not do that, but straight away parse the big image page, which only contains the big image. Can you allow formatting of the %works_date_only% date? Currently it’s M-D-YYYY with no leading zeroes which is just terrible. I would like a format like YYYY-MM-DD (one leading zero for month/day) which allows files to be sorted chronologically. you can try to log an issue in github https://github.com/Nandaka/PixivUtil2/issues for feature request, I’ll do it when I have time. Thanks a bunch, this works great! I found a way around though, simply open the config.ini file and remove the value of the “cookie” variable. You’ll find it in the Authentication group, in my case the value was a value with 40 characters, sorted like this: first 7 alphanumeric characters, then _ and finally 32 alphanumeric characters. I removed that value and it worked afterwards. Why do I set up mode R-18 but downloaded pictures R-18 only. How to set up to download both of them mode(R-18 and Normal)? PS. if you don’t understand I must apologize, because i’m not good English. Just set r18mode = False in config.ini. This will download both. can i export the old pixiv downloader database to new one? Assuming there is nothing in the new DB, just replace the file (db.sqlite). If not, then you need to use sql command to do it (google is your friend). Thanks. I think replace will do. *bit lazy doing such sql command. – right click immediately pastes without showing a menu as in Windows 7, which is nice, but new. Intentional? – since the last few versions, even going back to Windows 7, I have to manually delete the cookie reference in the config.ini file, because the app fails login using the old ones. I’ll post the error message when I get it again. – Right Click = This got nothing to do with the application, I think they change the console/cmd default settings. – Hiragana = Check you control panel setting for Language for Non-Unicode application, ensure it is set to Japanese. I’ve got a bit of a request here, though I’m not sure how one would implement this. See, when you’re a person like me, you’ve probably amassed the galleries of some number of artists. In time, one of the things that someone like me would like to do is make sure that the downloaded galleries are always up to date, however the program doesn’t have a real means of going into every folder, checking the MemberID, and then checking the artist page to download. So what I’d like is if such a feature was implemented. I would make the best assumption that the best way to go about this would be to have a file in every folder with the memberID in it, since some users would probably go out of their way to change the naming scheme of the downloaded folders. But this is just a suggestion really, but it would make it easier to make sure these folders are properly up to date when need be. You can set alwaysCheckFileSize = True and use proper filename format (e.g. %member_id%%image_id% and %member_id%%image_id%_p%page_index% for manga page) in config.ini. or you can use duplicate file finder to do the checking after download. I downloaded a member gallery on July 17. Some of the single images have a _p0 while some don’t. Is that a pixiv thing or the downloader? I only noticed when I updated an archive whose last download was on Feb 2015 and I got double images because of the _p0. It’s a new database so the latter archive wasn’t in it. That is from the pixiv server, I assume you are using %urlFilename% as the filename format. If I use %image_id% instead, that’s like %urlFilename% without the page right? Is anything with multiple images automatically manga format? Hello, is there a way not get the pictures saved in folders? I don’t see an option for folders in the config file. I just want all of the pictures in one folder instead of one for each artist. Never mind! I just Googled it, found an older entry when you answered the question. Wanted to ask: What are results of pylint, beyond removing some unused includes? It’s able to find unused variables, access to un-initialized variables, unreachable codes, etc. I did disables some coding conventions and ignore some warning. Should have read op. Sorry. Thank you so much for the prompt updates! By the way, there is a small mistake in the link of the new version, the colon after http is missing (+ a strange “use” before the address in the link). I also had errors saying the cookie has expired and also unable to log in from the config. this was on an older version so I downloaded the latest only to have the same problems. I’ve had the same problem with earlier version and tried different proxies already. Please tell me if there’s anything I can do or if it’s a proxy issue? can you login using that proxy from the browser? Looking the error code, it says connection reset by peer (https://msdn.microsoft.com/en-us/library/windows/desktop/ms740668(v=vs.85).aspx#WSAECONNRESET), either pixiv server or proxy server close the connection.